If you’re looking for a great gift for a fisherman, you’ve come to the right spot! You’ll love this unique personalized fishing chair and cooler! 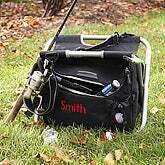 Perfect to bring along fishing to keep bait and drinks cool or carry along to the sports field for an easy and lightweight portable chair. Cooler can hold up to 24 cans – enough for a full day of fishing! Dad or Grandpa will love it for the easy access to the cooler while enjoying their favorite hobby. No need to worry about how to shlep this to the lake along with the fishing rods – it comes with a convenient carrying strap. And although it’s lightweight, it’s sturdy enough to hold up to 200 pounds. Be sure to check out our great selection of fishing gifts and fishing gift baskets!